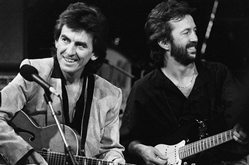 That Time George Harrison and Eric Clapton Had a Guitar Duel . Beatles Radio: The Beatles, Solos, Covers, Birthdays, News The Fab 4 and More! Of all the crazy stories that exist in any industry this one about George Harrison and Eric Clapton engaging in a guitar duel over George Harrison’s wife is something for the history books. Harrison and Boyd were married when Clapton fell in love with Boyd. He’d made a few passes at her before but he’d always been rebuffed for some reason. However, one night, after Harrison and Boyd had already been married for a bit, Boyd with with Clapton to listen to his music and was smitten by his lyrics. Layla was written by Clapton thanks to her inspiration it’s said and she was absolutely starstruck. After finding them hanging out together Harrison was floored when Clapton admitted that he was in love with Boyd. After asking her just who she was going to go with, Boyd finally went home with Harrison.